AA shocked at rise in amount collected by Auckland Transport for vehicle offences. Auckland Transport has been slugging motorists with fines of $3 million a month for parking and other vehicle offences. Figures it supplied to the Herald for its first 20 months have shocked the Automobile Association, which suspects they reflect “anti-car” tendencies of its Auckland Council parent. The figures detail $36.2 million of fines collected from motorists in the financial year to June 30. That leaped from $20.5 million for the previous eight months, from when Auckland Transport began business in November 2010. Although the latest total was for a longer period, the monthly average has risen to just over $3 million from $2.54 million in the organisation’s early days. The $17 million was Auckland Transport’s half-share of warrant and registration fines. The Ministry of Transport received the rest. But AA spokesman Simon Lambourne believed an increase in parking fines from $4.4 million for the eight months to last winter, to $7.2 million in the year to June 30, showed too much effort put into enforcement of a flawed system and not enough into education. That was not counting $16.4 million in court penalties for all types of vehicle infringement over the year. As for importance of the car to mobility; dang that is 1950’s thinking knowing where the AA is going with that line of thought! Look I do not deny the car as one of the sources of mobility in Auckland – that is ONE OF THE SOURCES! However we do have (and need investment) other sources of mobility such as public or active (walking) transport that need equal attention (if not more) as the car. In my submissions to The Auckland and Long Term Plans I gave equal weight to both car and public transport in investment for Auckland. An example was $3.6b on the City Rail Link and Rail Efficiency Program while an equal amount of cash was allocated to The Eastern Highway and the East-West link in Penrose/Mt Wellington. All three of those projects have high benefit to Auckland and are considered Priority One and Two (so completed by 2025 or 2032). There is no skewering towards one particular mode of transport over the other here. Last week I wrote a post on how Auckland Council and Transport were planning to change the parking regime in the Auckland CBD. In the post I spelled out the pros and cons of such a change (mainly cost of parking would be more expensive than Central London (exchange rate taken into account) and my viable alternative to such a regime – both pre and post City Rail Link. Parking Garages on the outskirts of the CBD, complemented with shuttle buses, and the City and Inner Link Buses (for the North Shore you would need a big park and ride at Akoranga Busway Station). This would allow people to drive from the suburbs to the CBD outskirts, park up then catch a shuttle, bus or train into the main CBD core. You would also get spin offs through being able to add more pedestrian malls and shared zones with reduction of inner CBD traffic. A working and frequent off-peak service to give better incentive to come into the CBD via mass transit from the suburbs (could mean extending timetables and better security on mass transit to discourage anti-social behaviour (a real turn off from using the bus or train). Next to Grafton Station (the old Brewery Site is up for redevelopment) and may be Mt Eden Station on the Western Rail Line. Well today I drew up some maps of this alternative scheme, and filed my submission to Auckland Transport formally opposing their Central City Parking Zone WITHOUT viable alternatives in position first. Waste to Energy for Auckland? It has been proposed by Councillor Wood that Auckland should investigate and if deemed feasible (a plant of the size of Taipei City costs $400m estimate) build such an incinerator for Auckland. I propose one better and go the full hog in building a Waste to Energy Incinerator to take care of our trashy trash! Basically that means the trash is burnt at extremely high heat (1000-1200C), the waste heat is then either used to boil water (good cooling circuit for a furnace burning at 1000c) to produce steam and crank that turbine for electricity generation or sent to heavy industry nearby for use, and the ash used to make bricks or roads. In thermal WtE technologies, nearly all of the carbon content in the waste is emitted as carbon dioxide (CO2) to the atmosphere (when including final combustion of the products from pyrolysis and gasification; except when producing bio-char for fertilizer). Municipal solid waste (MSW) contain approximately the same mass fraction of carbon as CO2 itself (27%), so treatment of 1 metric ton (1.1 short tons) of MSW produce approximately 1 metric ton (1.1 short tons) of CO2. In the event that the waste was landfilled, 1 metric ton (1.1 short tons) of MSW would produce approximately 62 cubic metres (2,200 cu ft) methane via the anaerobic decomposition of the biodegradable part of the waste. This amount of methane has more than twice the global warming potential than the 1 metric ton (1.1 short tons) of CO2, which would have been produced by combustion. In some countries, large amounts of landfill gas are collected, but still the global warming potential of the landfill gas emitted to atmosphere in e.g. the US in 1999 was approximately 32 % higher than the amount of CO2 that would have been emitted by combustion. Southdown/Penrose has a gas fired co-generation power station (so produces power and steam for industrial use) already there connected to the National Grid and disused meat works site next door that needs major urban redevelopment. Like Meremere, Southdown sites with extremely easy reach of road, rail and power grid links but with the added bonus of having industry near by that would use the waste heat for their usage (ACI Glass being one example and only just down the road). The extra spin-off with Southdown is it is right in the middle of Auckland so no need for excessive waste transportation for incineration. If you are concerned about the emissions from a waste to energy plant, then go read the wiki article and more to the point its references attached. It seems the developed world can handle it so we should be able to as well, because we are First or Third World folks? Recycling, Composting and Waste to Energy = First World. So Auckland Council, lets keep it simple please. Now then, to get that investigation and plant building going so Auckland can take care of her trash! The Late Owen McShane taught me that any “plan” over a thumbnail in thickness (on A4 paper – no cheating with A3) is a: dead weight, too complex, and albatross around the city and ratepayers neck. I would be a case of Gin that the Unitary Plan is going to be thicker than my thumbnail to the point it is going to be thick as my fist (yes that means the plan makes a fist of things). The K.I.S.S rule needs applied to the unitary plan, but to do that in benefit of the city, 3/4 of our bureaucratic and Stalinist Planning Department in Council would be all out of a job. Maybe that might be a good thing? Thumbnail in thickness being the absolute maximum that ANY operating plan should be! Well it seems the Unitary Plan is going to fail that little test so I devised some crude measurements here. 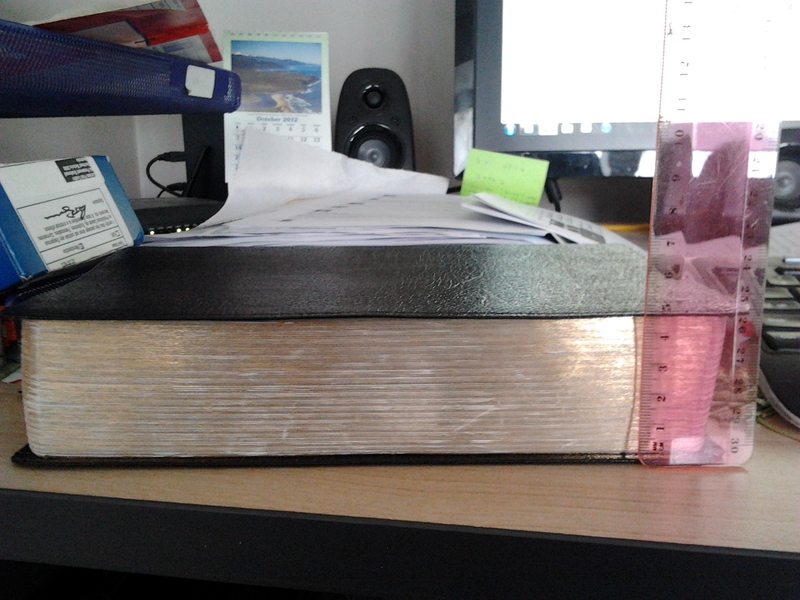 I measured the thickness of thickest and largest Bible in the house; the NIV Life Application Bible standing at 48mm (4.8cm) and some 2385 pages in thickness. 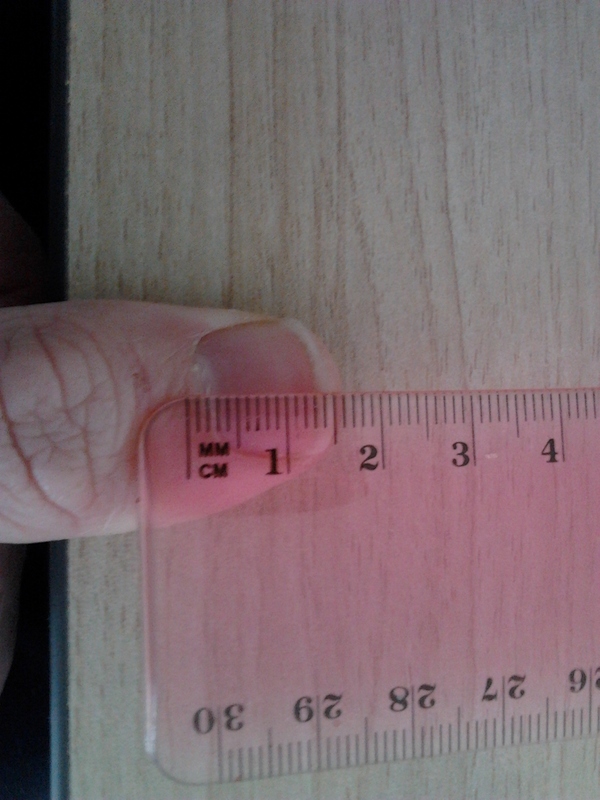 I also measured the thickness of my thumbnail which stood at 18mm (1.8cm) which means in theory the Unitary Plan using A4 paper (A3 for any maps – I’ll be generous there) should not be thicker than 20mm (2.0cm) at the absolute maximum. However again that does not seem likely. 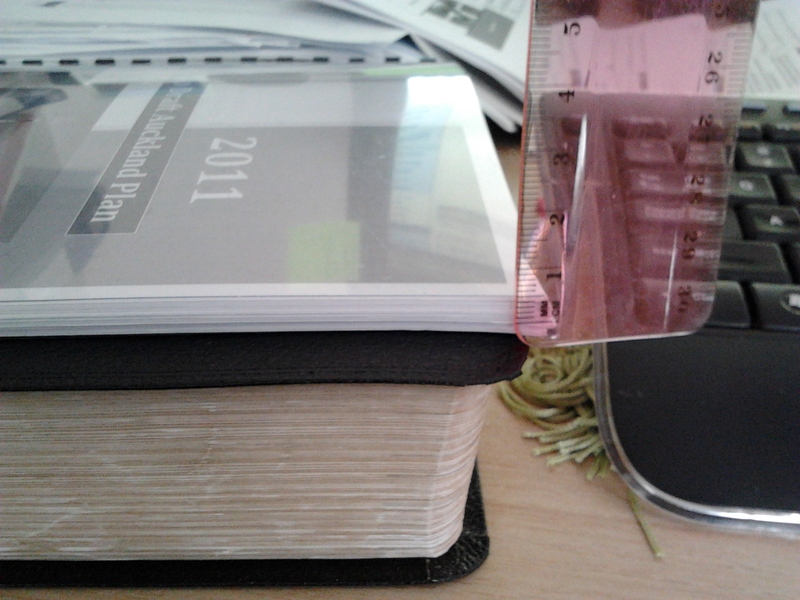 Thickness of the NIV Life Application Bible stands at 4.8cm or 2385 pages. It is believed at around A3 paper size in average for the paper used, the Unitary Plan stands as thick as this Bible. 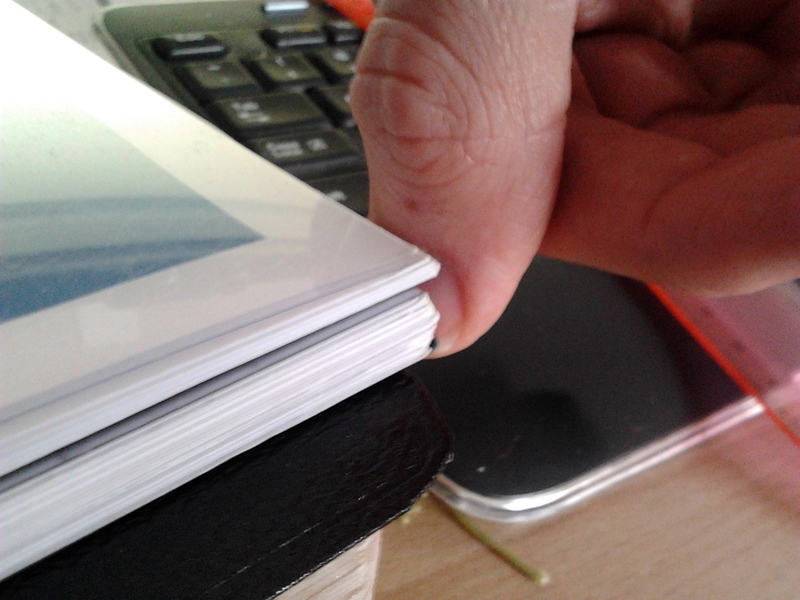 9mm (94 pages) in thickness (or half a thumbnail) when both my submissions to the Auckland and Long Term Plans are combined. 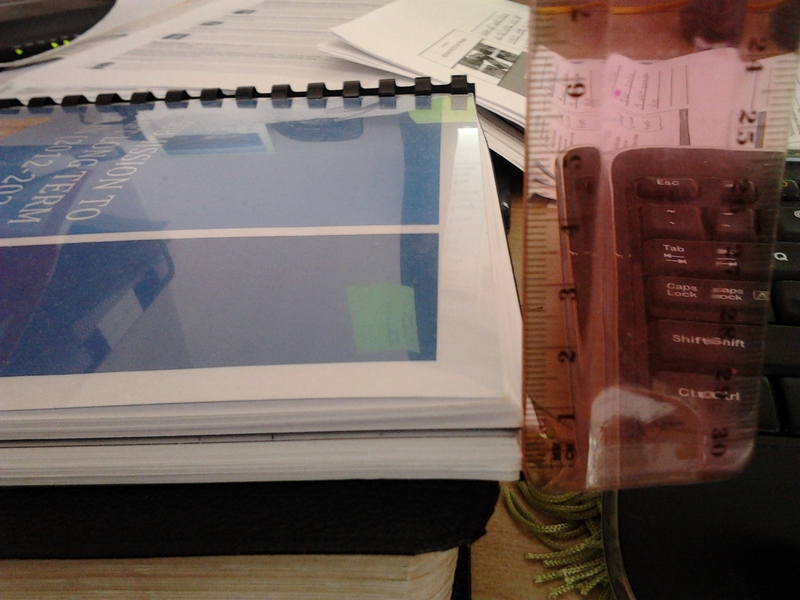 With 18mm being the thickness of my thumbnail (make it 20mm for a tolerance factor) and applying the K.I.S.S rule quoted above, the Unitary Plan should not be longer than 200 pages or both my submissions doubled up in thickness. But no we are seriously looking at a massive behemoth that is looking to be as thick as our largest Bible at home. Heavens sake what is wrong with our planners – do they not understand thrift and simplicity? Obviously not or I would not be writing this post. Stay out of my way: I believe in the following strongly “Individual Freedom -> Individual Choice -> Individual Responsibility (oh and do not forget the consequences)” I am an adult who can make choices for myself (whether it was right or wrong), treat me as such rather than a child. Listen and Engage: God gave us two ears and one mouth. In my line of work you actively listen with both ears THEN engage in dialogue with your one mouth. Not the other way around as that is usually monologue and the fastest way to get your ears clipped. Same applies to civic institutions: you actively listen with both ears THEN engage in dialogue with your one mouth unless you like getting your ears clipped… Oh and remember some days all the person wants you to do is JUST LISTEN to their little piece – as all we want some days is just to get it off our chests. Dialogue not monologue (from the bureaucrats and Councillors)! BR:AKL will run commentary as I attend this Civic Forum on the Unitary Plan and the outcomes from it. Stay tuned as I strive for you a Better Auckland – and hoping like anything the Unitary Plan does not become as thick or thicker than my Bible as that would be really thick! Tonight I was notified of a public meeting facilitated by Papakura Councillor Calum Penrose (so my local Councillor) here in Papakura (my home and community) on opposition to a liquor store being opened in the area. So I trundled down to Papakura Central School where the meeting was held, said my hellos and took a seat to listen to proceedings. Normally in public meetings (as well as hearings) I might get up and ask questions or have a say, but tonight this was new territory for me so it was a case of sit quietly and observe what was going on in this public meeting. Angela Dalton shared Daniel Newman‘s photo. Calum Penrose, Raj Thandi, and Angela Dalton working to stop the opening of a liquor store in Pahurehure. Attended my first public meeting inside my on Local Ward (Maurewa-Papakura) on opposition to a Liquor Outlet being opened in the area. Was a good discussion lead by Local Councillor Calum Penrose. — with Daniel Newman and Angela Dalton. As I said above; while I have been to public meetings before they have been outside my Ward (so Orakei and North Shore), this one in Papakura as I stated in my Facebook status my first LOCAL public meeting – so new territory. But while new territory tonight, it was also an excellent learning experience for me. There was a chance to mingle afterwards where I would make introductions and conduct some networking like I have done in Orakei and The North Shore; however a fatality on the Western Line tonight (groan) forced me to return home to support Rebekka who had her shift extended by half to assist with all the “disruption” that goes with a fatality. But in saying that, while tonight was my first LOCAL public meeting where I got to observe the locals in my or rather our own local community, it shall not be my last! The people present are locals, fellow locals in our fellow community that is Papakura, and the very people I wish to represent next year after the Local Government 2013 elections. So my focus is returning home Auckland, to Papakura. Yes I will keep an eye out for wider Auckland, especially as the Regional Public Transport Plan and Unitary Plan are either up or coming up for submissions. But attention is now back to the home front as it is where I live, play, work (in part) and shop. That home as I have said is Papakura. Yes I will still attend submission hearings and pop over to other Wards in Auckland to pay a visit, but my primary attention and focus is now returning home – to Papakura. How Well do Our CCOs Rate? Bernard Orsman of the NZ Herald wrote a two part series about Auckland‘s Council Controlled Organisations – a.k.a The Auckland Bureaucracy. What was interesting first up was the fact that the some of the CCO‘s could be up for a merge, or downsizing. That is fine with me to get some savings back to the ratepayer so long as our services are not affected. Saving $ is great but what I am interested in is the improvement in communication and interaction with local boards Hope this will be reviewed at the same time Happy to input! Desley Simpson No guesses needed as to what you are referring to there Ben! Upon reflection of that comment, ATEED is the CCO that needs the biggest kick up the backside for the amount of grief that CCO has put Auckland through. From the Rugby World Cup to the V8 Pukekohe saga, ATEED seems to have the knack in really annoying Auckland ratepayers from either daft decisions or being all Secret Squirrel with Councillors and the public over some of its decision-making processes (The V8s being the most recent). So using Desley’s remark on interaction and communication, ATEED fails badly there. As for that other CCO that we shall not name and I was initially commenting about, well I can not exactly give it a kick up the backside for interaction and communication as that CCO which we shall not name has actually improved, especially if their Twitter communication and interactions are anything to go by as that has gone for strength to strength. So thumbs up there. As for a few other things, well we shall say that is a work in progress folks and leave it that. But at the end of the day it is the communication and interaction that the CCOs really need to work on. While at arm’s length from Council Governing Body, having a healthy and open relationship with the GB, Local Boards and the ratepayers would be a wise idea unless the CCOs want open hostility from the ratepayers on a really good day. Basics first: One thing I learnt when I moved out from the parents’ home and struck it out in the real world (including getting married and owning our first house) is that with the limited resources you have got, you did the basics first then with anything left over you just might be able to afford a luxury. Same applies to our civic institutions; they have limited resources so get the basics right first then “treat yourself or others” to a luxury if you are able to do so once the basics are taken care of. Listen and Engage: God gave us two ears and one mouth. In my line of work you actively listen with both ears THEN engage IN DAILOUGE with your one mouth. Not the other way around as that is usually monologue and the fastest way to get your ears clipped. Same applies to civic institutions: you actively listen with both ears THEN engage IN DAILOUGE with your one mouth unless you like getting your ears clipped… Oh and remember some days all the person wants you to do is JUST LISTEN to their little piece – as all we want some days is just to get it off our chests. That was from my What Do I Stand For and Believe In – For a Better Auckland. Something I will be using as benchmarks if elected to Papakura Local Board next year to see how our CCO’s are treating the ratepayers and their money. But if the Herald article from yesterday was anything to go by, all three points above need some serious working on from ALL our CCOs. In the meantime back to submission writing! Was a busy day in the NZ Herald today with two different articles on Auckland’s Transport, and another two on our Council Control Organisations. In both these cases I have run commentary on these and are giving specific mention in my submission to Auckland Transport‘s Regional Public Transport Plan. Further commentary will be at hand as the week advances and I continue my RPTP submission. In regards to these issues, I have run commentary on this before and it seems I will be doing so again here at BR:AKL again this week if not next week. CCO’s being secretive is one of my pet hates and a campaign plank as I run for Papakura Local Board in next year’s Local Government 2013 Elections. So yes today was a very busy day in the NZ Herald, with plenty more to campaign on for a Better Auckland here at BR:AKL! Housing New Zealand is seeking a private partner to build houses on former Papakura army camp land. Earthworks for Auckland’s biggest low-cost housing development in 25 years will start next month on land that used to be part of the Papakura army base. Housing New Zealand is seeking a private sector partner to build between 450 and 500 homes on the 24ha site between Walters Rd and McLennan Park. Tenders close on October 16. Its general manager of asset development, Sean Bignell, said the homes would be a mix of 10 per cent state houses, 20 per cent other social housing and 70 per cent for private sale at prices likely to be “in the high 200s to the high 300s” – putting most of them below the lower quartile mark of Auckland residential properties sold this year. Finance Minister Bill English said recently that high land prices had skewed Auckland builders towards large, high-value houses, and there was “no housing being built for people in the lowest quartile of income”. “That is clearly unsustainable,” he said. A start on the Papakura project comes as Housing NZ bows out of another long-planned 10ha development next to the Weymouth child welfare home, which the new Social Housing Unit in the Ministry of Business, Innovation and Employment has allocated to “third-sector” social and affordable housing. So between 450-500 new houses are to be built in the vicinity to where I live. Hmm means its going to be noisy and dusty for a while but I am not particularly minding too much. Look we need more “affordable” housing and if Housing NZ can take the lead in offering this affordable housing then so be it. If I was to have any concerns it is not around the fact “low-cost” housing is about to be built in my backyard; my concern is around the urban design factor which sets the future for this large-scale project for life. I assume the houses will be a mix of 2-4 bedrooms on sections between 400-600m2? I need to go hit up my Local Board and take a look at the plans as they are not easily found online at the moment. The plans would tell me what kind of urban design work is being done and whether the urban design method chosen will be a benefit or a total hindrance to the future of this development. And something tells me the urban design of this development is actually going to be a hindrance more than a benefit here. How so? If we want the kids to at least have a decent backyard to play in and maybe grow the vegetable garden as well (although that is a lost art in Auckland) I would suggest 450m2 sections for three and four bedroom houses would be a generous and comfortable size. Anything smaller and we get no yard space for the kids and that can generate problems if there are no parks nearby. And no Bruce Pulman Park does not count unless you want to cross a very busy Walters Road while the McLennan Park is often used for sports. From what I have also gleamed from the graphic for this new development, thankfully the roads inside the new development are grid which promotes easy of traffic (foot and vehicle) flow while mitigating against the Fear of Crime perception that often comes about in urban development. However there are only two ways in and out of the development (so connecting to main roads) which could be a bit of a pain and isolating factor to this new development. In fact the lack of access to the main roads could isolate this new development and lack of accessibility can mean crime can fester inside the development. In all that regard, I am going to have to go take a look at the plans to see what is exactly proposed. As I said nothing wrong with new development even in my backyard (I knew things like this would happen in Papakura when we chose to move here), but piss-poor urban design that turns this much needed housing into a crime-bed will not go down particularly well with me. Now as for public transport access. This development is somewhat isolated from the main bus network which runs up and down the Great South Road. Rail-wise you have Takanini and Papakura Station both within 5-minutes of each other although 450 new houses will put pressure on Papakura’s existing Park and Ride which is already short of spaces. This new development would be the perfect time for Auckland Transport to haul arse and get the new Walters Road Rail Station along with a Park and Ride (with 450 spaces) and shuttle bus bay to serve Papakura north, Addison, Takanini east and the new development soon to be built. Trying to encourage public transport with Walters Road Station and Park and Ride would be a good start in improving public transport accessibility, especially for our new residents soon to move in. Papakura Local Board as well as myself support and are advocating to AT on the Walters Road Station, this new development PLUS the continued development of Addison would be the perfect catalyst into getting our new station by 2015! I have written in previous submissions as well as the current submission I am writing (the AT Regional Public Transport Plan) for the construction of Walters Road Station, and am making it an election campaign pledge to continue to have the station built sooner rather than later in the Local Government Elections next year! But in the mean time, I shall go search those plans for this new development.